For many years, Nohau® has had real-time operating support. Different flavors have been done. The implementations based on dll�s have been mostly successful but suffered from maintenance difficulties. Now, a new implementation method is available. Microsoft has defined the com interfaces to enable different applications talking to each other. A real-time operating system (RTOS) vendor can now write an ActiveX / com object that can present all the information on the screen for a particular RTOS. This ActiveX component will integrate easily with ICE Technology �s Seehau user interface as long as it follows the Nohau® RTOS interface specification below. ICE Technology is here making available the interface specification to RTOS vendors that would like to implement an RTOS Window in Seehau. Several development platforms can be used by the RTOS vendor to take their current presentation screen and wrap it in an ActiveX control wrapper. For instance, with Microsoft, an MFC application can be used as the foundation for a presentation screen, and then turned it into an ActiveX. The ActiveX control usually carries the extension .ocx. The parameter carries the name of the emulator. It should be followed by the emulator family (EMUL51, EMUL68, EMUL16, EMUL300, EMUL196, EMUL296, EMUL251, EMUL51XA, EMUL166, EMUL-ST10, EMUL-M16C, EMUL12). The next parameter is optional, and will denote if the emulator is in demo mode (DEMO). The name is emulator manufacturer specific (Nohau in our case). The intention with this method call is to let the RTOS module perform any necessary initialization and notify it which emulator it is interfacing to. 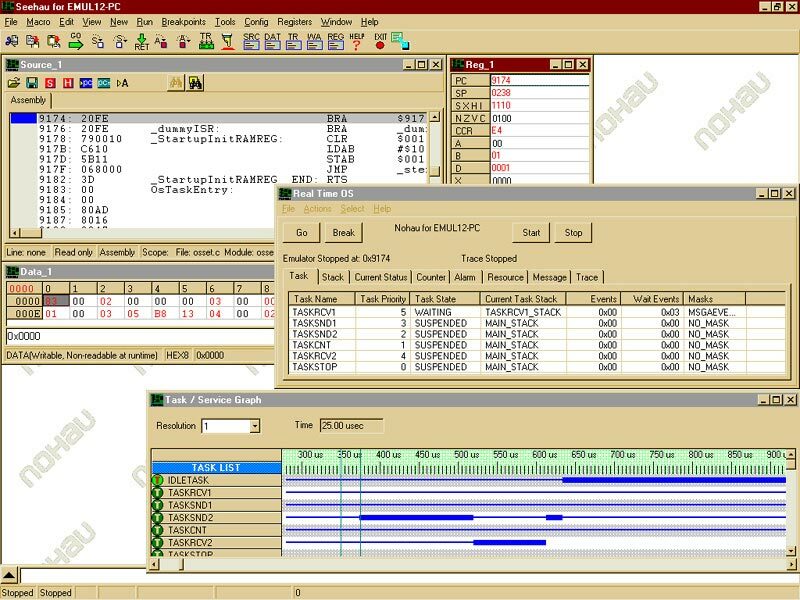 The ReadMemoryTest method call is used to allow easy testing of the RTOS module. It is intended that Seehau can call this method to request the RTOS module to fire a ReadMemory event. The parameters used in the read memory event should be the same as specified in this method call. For explanation of the parameters, please see under the events below. Click here to display a Screen shot with a RTOS window.